Overview: Offers Linux and many unlimited features at different price points as well as high quality service and excellent technical support. Unlimited disk space, bandwidth, domains, subdomains, MySQL, POP3 accounts, etc. Instant blogs, portals, forums, guestbook, formmail, etc. 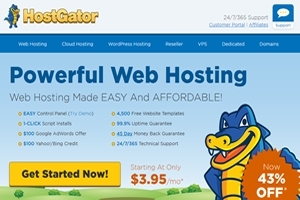 Bottom Line: HostGator is one of the most popular web hosts on the entire Internet. Especially with Internet marketers. HostGator offers several shared hosting plans at different price points that most any budget can afford. And when it is time to upgrade due to success they have everything from reseller accounts, to VPS, to dedicated servers. Click here to visit HostGator now!